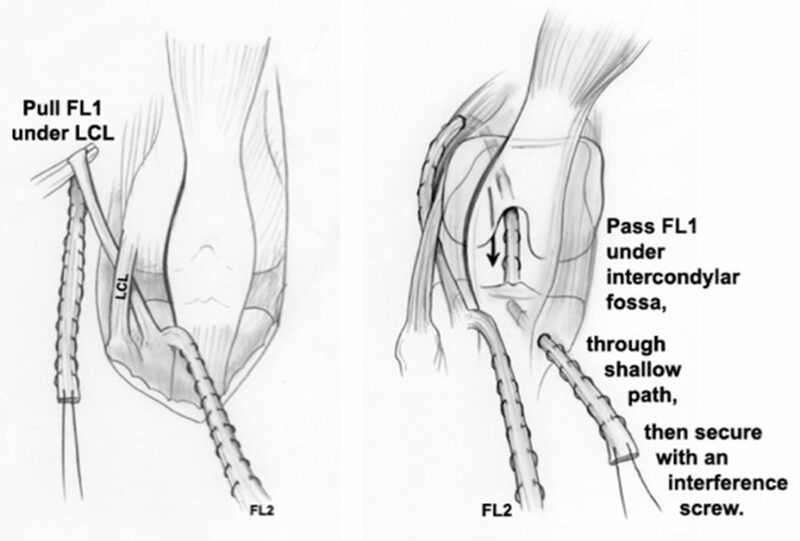 The first step is to take the fascia lata and use it to reconstruct the anterior cruciate ligament (ACL) and the posterior cruciate ligament (PCL). If the patient had a SUPERhip, the fascia lata has already been resected. Next, the fascia lata is split into two ligaments, referred to as FL1 and FL2. 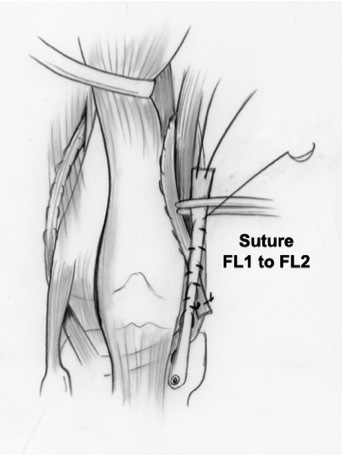 The FL1 ligament is used to make the ACL and the FL2 is used to make the PCL. In order to reconstruct the ACL the FL1 is pulled under the lateral collateral ligament (LCL). The FL1 is then passed under the intercondylar fossa (the deep notch where the femur meets the knee joint). The other half of the fascia lata (the FL2) is then used to make the PCL. Dr. Paley developed this ligament, and it is sometimes referred to as Paley's ligament. 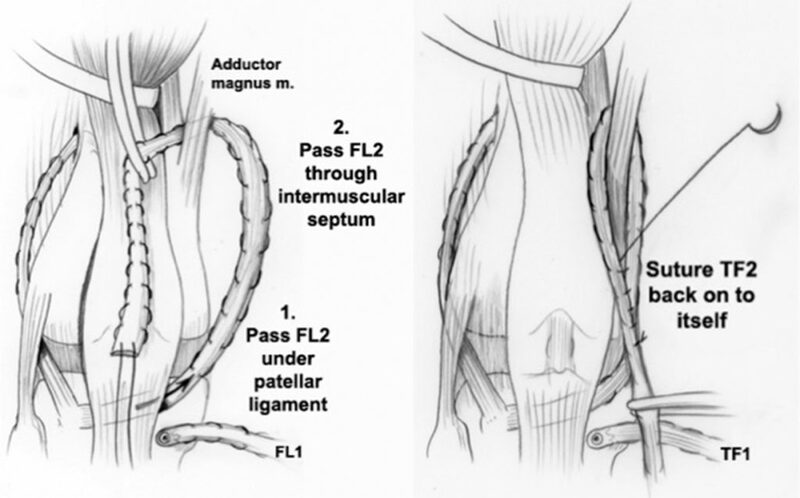 The FL1 is passed under the patellar ligament and the FL2 is passed through the intermuscular septum. The FL2 is then sutured back onto itself. The final step is to connect the two ligaments (FL1 and FL2) together for extra reinforcement. If needed, the kneecap is then realigned. In some patients, they are unable to straighten the knee joint and a posterior capsulotomy (release of the soft tissues of the back of the knee) has to be performed. When the posterior capsule is released, it is often necessary to pin the knee with internal wires to hold the knee fully extended for six weeks. At that time the wires are removed. Each patient’s SUPERknee is customized to the parts of the procedure needed for each individual. For example, in one case the reconstruction may only include the ACL and PCL, but not any surgery for the knee cap or flexion contracture, while in another, it may only be to correct a flexion deformity of the knee.